There’s only so long I can be mad at cashmere! Sabine’s time out has come to an end! It only took one little pet to convince me! I’ve made up for all I had to frog and I’ve even gotten a little bit beyond there! There she is! I’m about to leave for a day that’s going to include several cross town bus rides…bag is packed and ready to go! Today’s take along project was not Sabine, but now that I’ve looked at her for just a brief moment, I definitely need to repack the bag. I’m so excited to see Sabine and I’m ready to make up for lost time! I want to wear this sweater…yesterday! I mentioned yesterday that I used to be an English knitter. I was very resistant to change. Old habits die hard. Continental would be faster in the long run but not knowing what the learning curve would be kept me from switching for a long time. Eventually, I caved in (thanks to carpal tunnel like problems) and made a serious effort to switch! I’m happy to say, I am finally and officially a Continental knitter!! 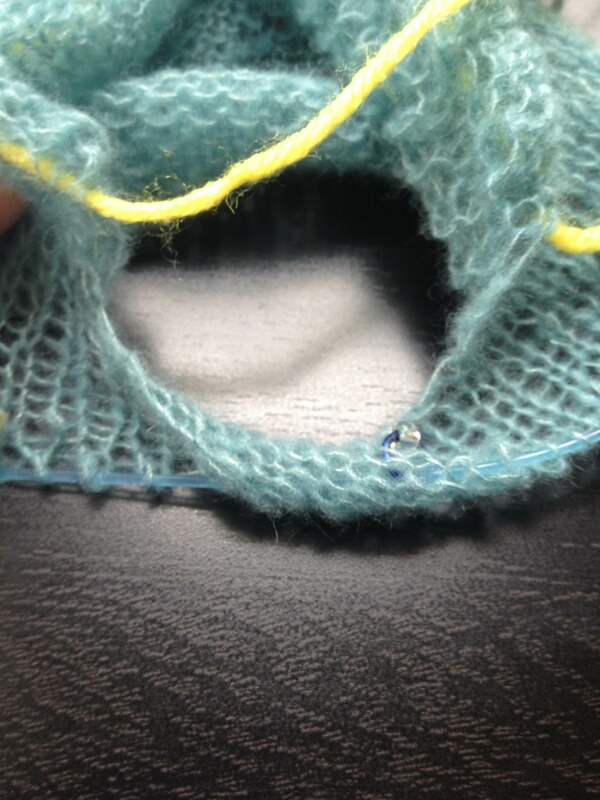 The last hurdle for me…knitting in a dark movie theater! It’s something I did often and without worry as an English knitter! And now, I can do it as a Continental knitter too! Woot! I’m pleased to say, I’m a better knitter than both Nicholas Hoult and Helen Hunt! I even fixed a dropped stitch in the dark! Go me! I’m off to see Pitch Perfect 2 today…hopefully I don’t get too cocky and mess the whole thing up! Today’s WIP was started in February of 2014! It’s been in the time out corner so long, it’s never made a blog appearance! I’ve been feeling a bit guilty for punishing Sabine with an extended trip to the time out corner, through no fault of her own. Not sure how picking up this long abandoned project assuages that guilt, but it has! 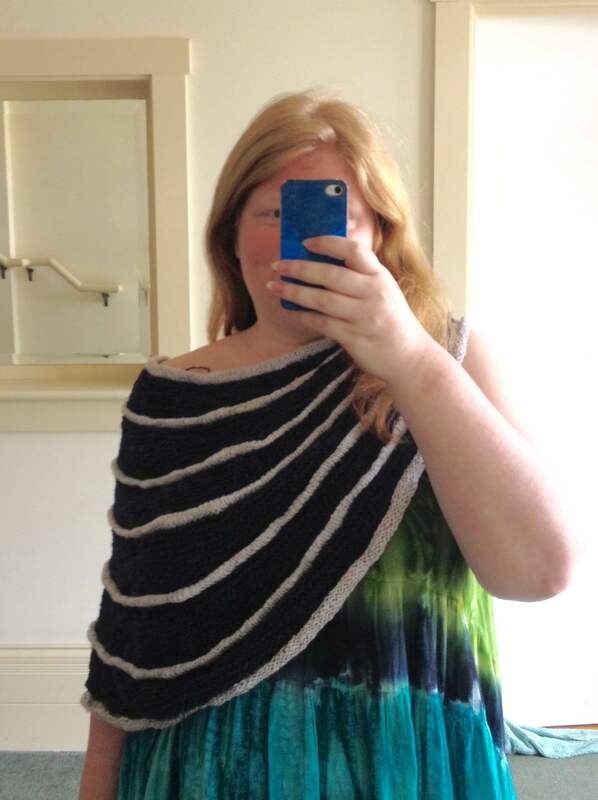 This is the Colonnade Shawl by Stephen West (why yes, I am a WestKnit addict, have you noticed?) It was a free Knitty pattern many moons ago! 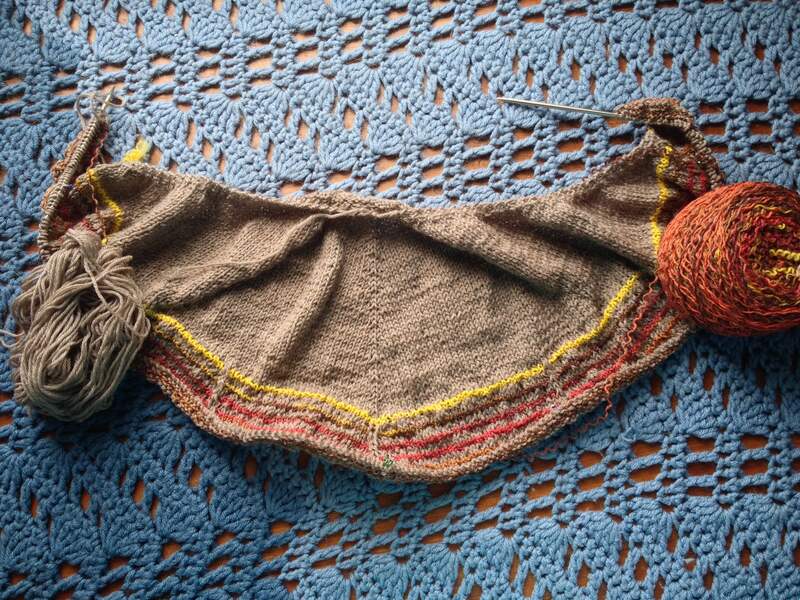 I started this shawl when the yarn (Plymouth’s Galway Worsted) was donated to me in a fit of destashing. At this point, even I’ve destashed most of it, keeping just one skein to finish this shawl! The interesting thing here is the visible shift from when I picked it back up (at least visible to me-probably one of those things I fixate on and no one else even notices.) I’ve added nearly all the lace bits since Saturday, about an inch is from the original knitting. When I put it down, I was a mostly English knitter. 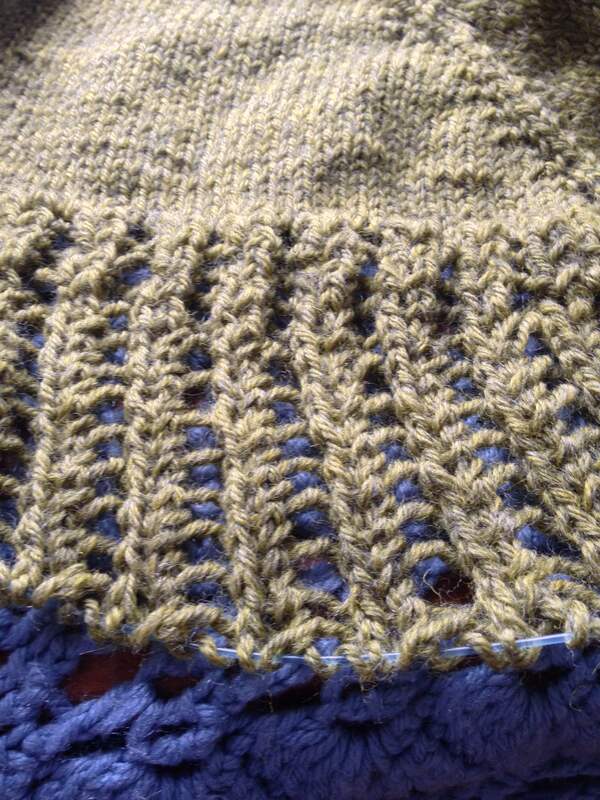 These days, I’m a mostly Continental knitter. I’m happier with the Continental piece…because I know how much quicker it was! 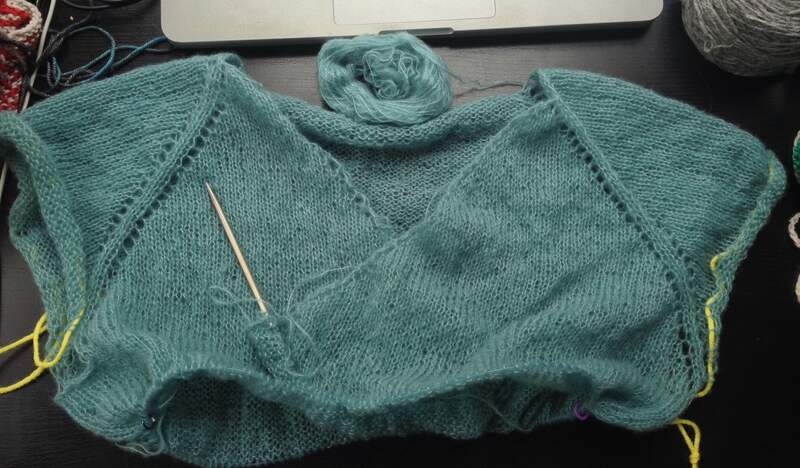 Fingers crossed that most of the shift I see will block out at the end! I’m flying along! This should be off the needles very soon! 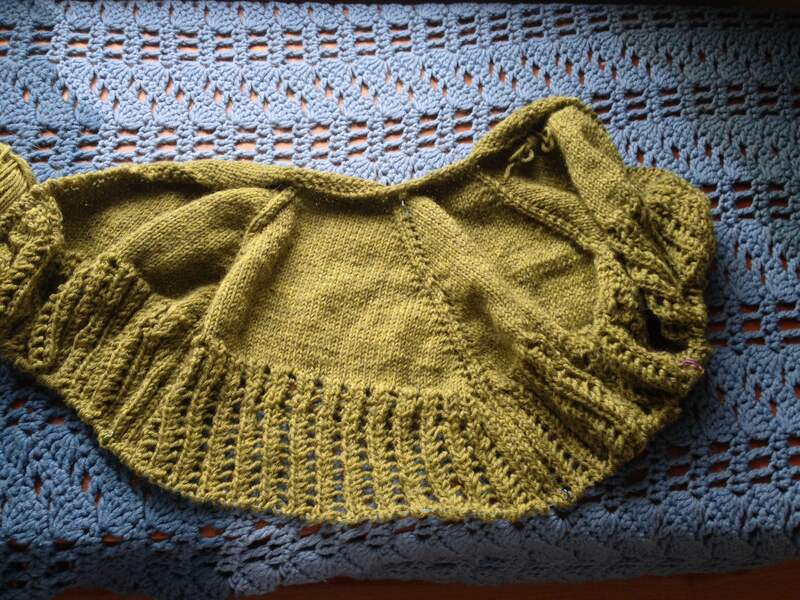 And I’m nearly ready to pick Sabine up again…last week’s fit of frogging is nearly a thing of the past! Phew! 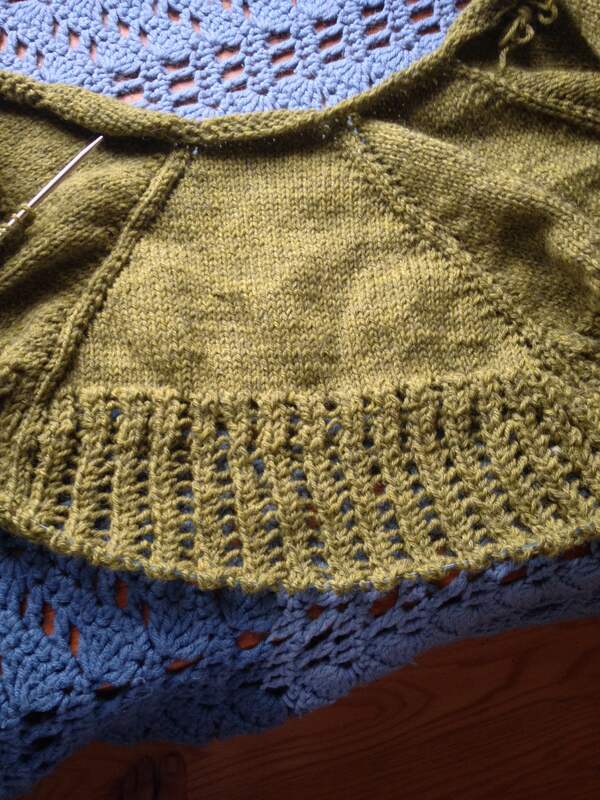 After much frogging last week, I’m happy to report on a project that is having no problems! 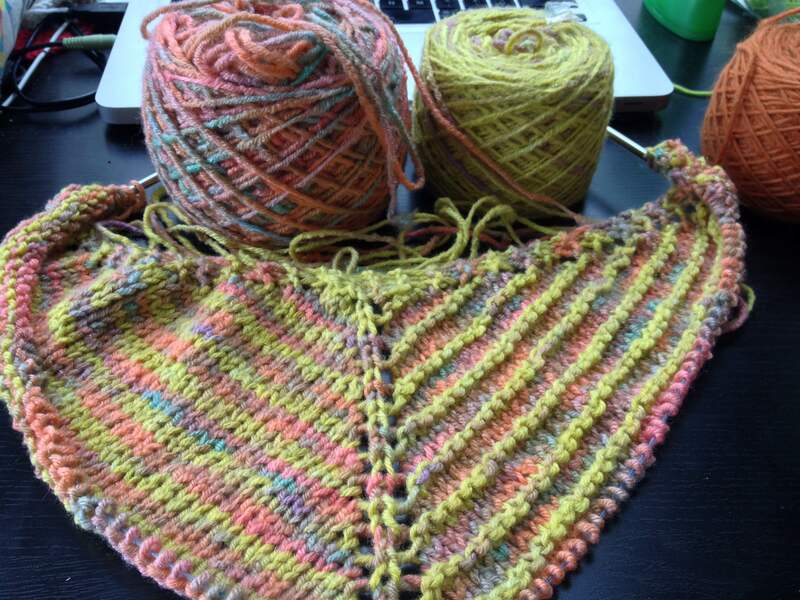 During last weekend’s cast on binge, I started a shawl with Mom’s first sock blank! These are not normally my colors, but I just couldn’t resist! Mom also dyed a green/blue/purple sock blank for me…those are my colors! This lovely combination of fall colors really spoke to me though! I’ve paired it with a heathered beige and so far, so good! 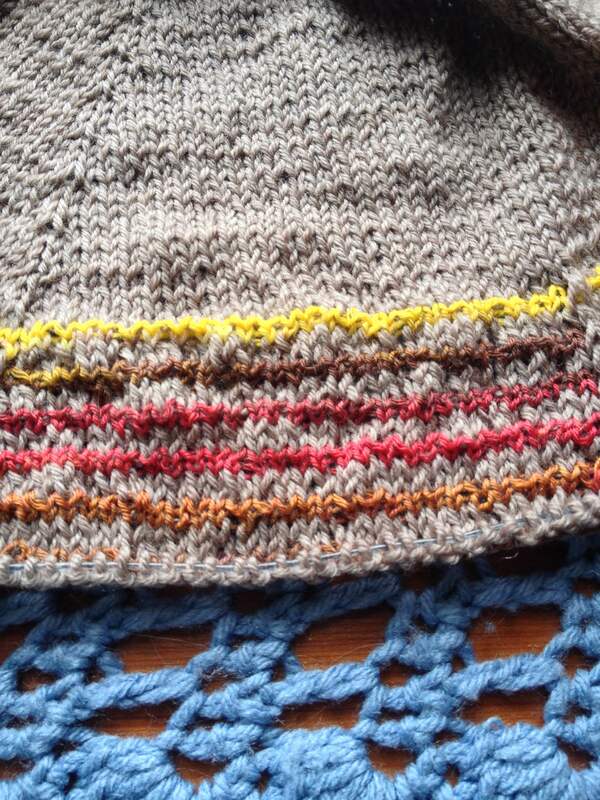 The pattern is Stephen West’s Daybreak. 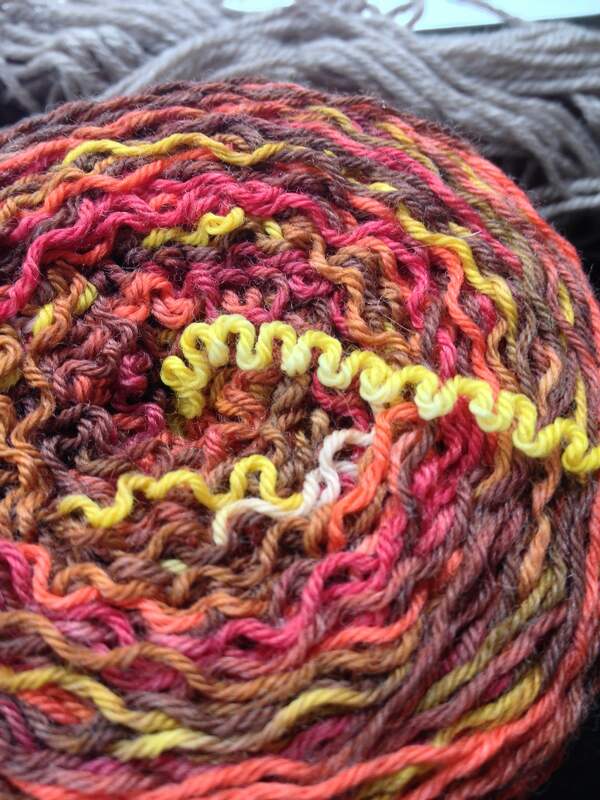 If I don’t have a WestKnit or two on the needles, take my temperature…I’m probably sick! As usual, I’m loving this design! It’s been in the queue for a while, just waiting for the right yarn to come along! 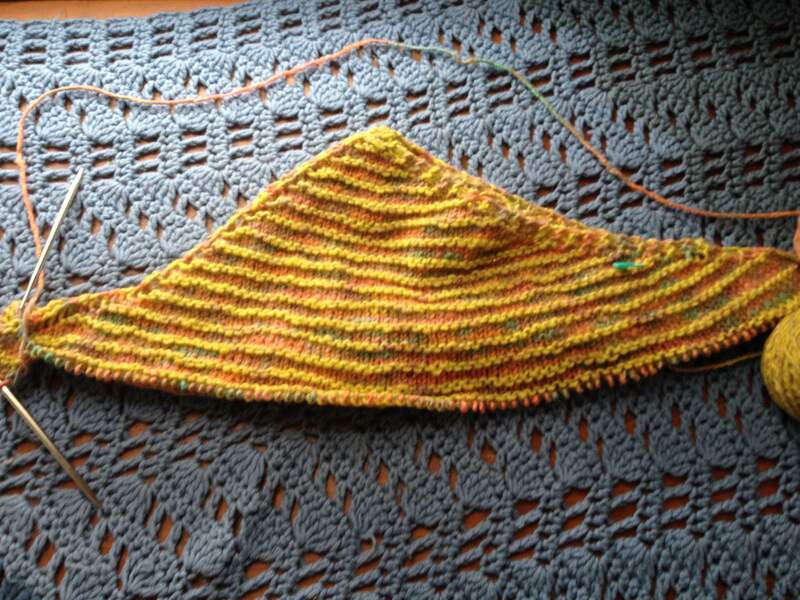 The stripes really help things fly along…it’s so fun to watch the patterning develop. The simple pleasures of knitting! 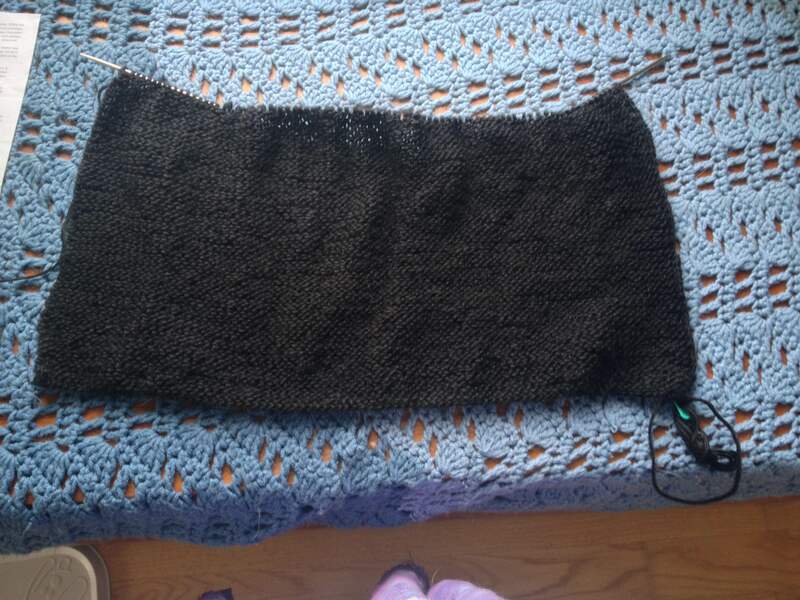 I’ve made much progress in a week, already to the point where it doesn’t lay flat on the needles! I should really pick Sabine back up, not ready to let this one out of my hands though. Maybe later in the week! Maybe. Sabine the Troublemaker is still in the time out corner, which means my new favorite project is definitely the shawl I’m working on with the yarn Mom dyed for me! It’s inspired me to try my hand creating at cowl/shawl hybrid of my own. 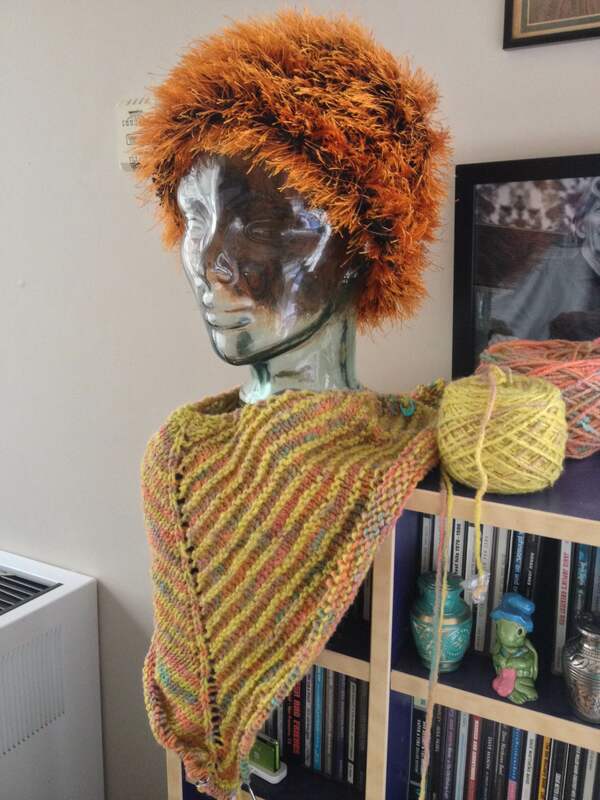 I started off with a basic, top down shawl, worked flat. Here it is modeled by John Malkovich, my glass head, and my cd rack! They did a much better modeling job that I did myself this morning! Unfortunately, I don’t think I like those colors together anymore. I see a bit of frogging in my future but it’s for the greater good. No need to finish a garment I’m not loving (and to say I’m not loving this is an understatement). I’m seeing grey in my future! Grellow is a thing for good reason, right?! That is a twist in my underarm cast on. It is a fatal flaw. It can’t be fudged away. It has to be ripped out to be fixed. And it’s a direct result of careless work. 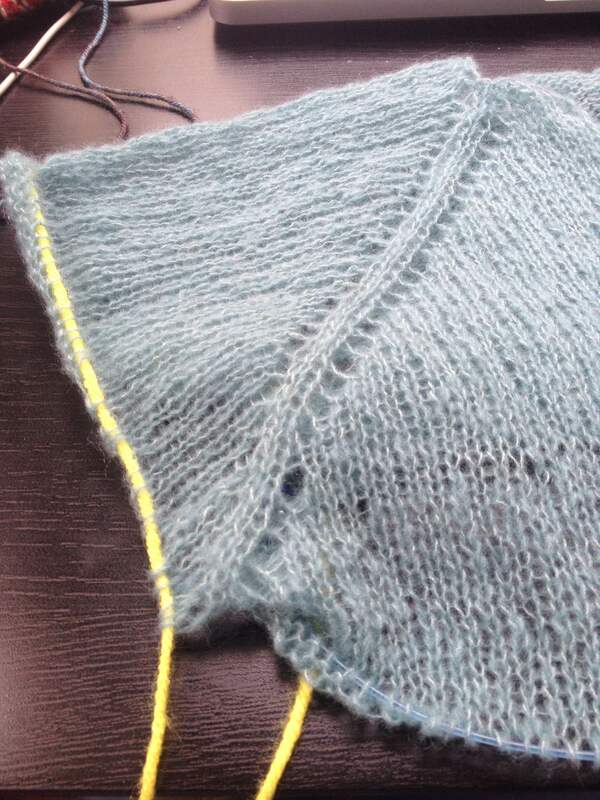 I thought about using a cable cast on in the underarm but before I could even finish acknowledging it as a possibility in my brain, my hands had already done a quickie backwards loop cast on and carried on. It happened so quickly I barely thought about it and it shows. Had I been just a little more present, this wouldn’t have happened. Turns out, it wasn’t actually that dramatic at all. It ripped well with a little care and caution. So I’ve had an inch of setback. Big whoop. That’s virtually nothing. And it looked pretty great off the needles! Stupid mistake fixed. Lesson learned (hopefully)! So back to the knitting. Tomorrow, maybe. Sabine is still sitting in the time out corner for a day or two. Drama – real or imagined – takes time to get over! 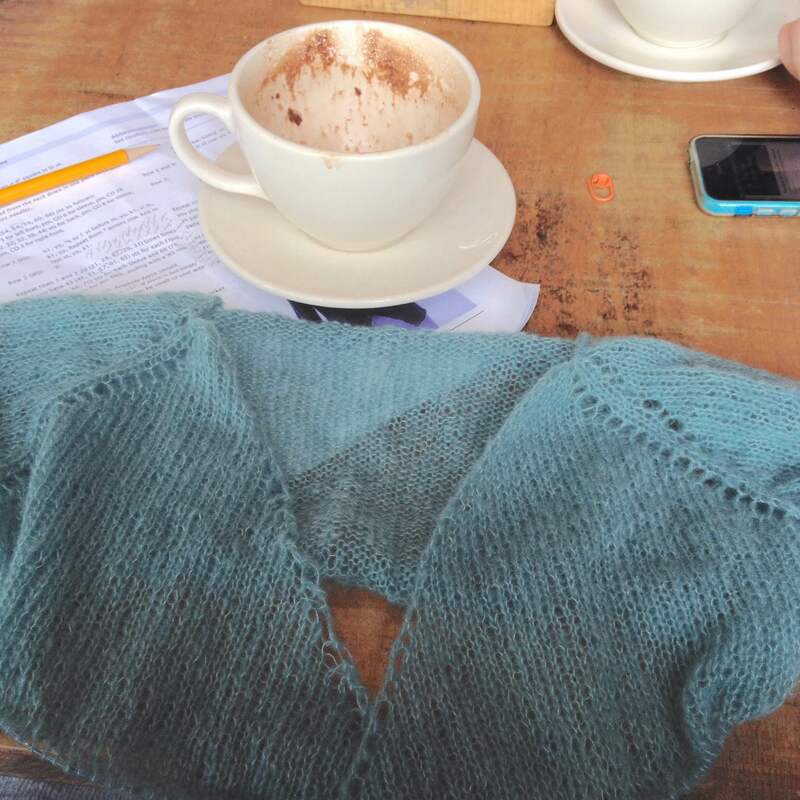 With my new devil-may-care attitude, I zipped along and finished my raglan increases. I divided the sleeves with gusto and now, I’m faced with a lot of back and forth and nothing else! The pattern calls for two lines of eyelet detail down the back but I’m skipping it. 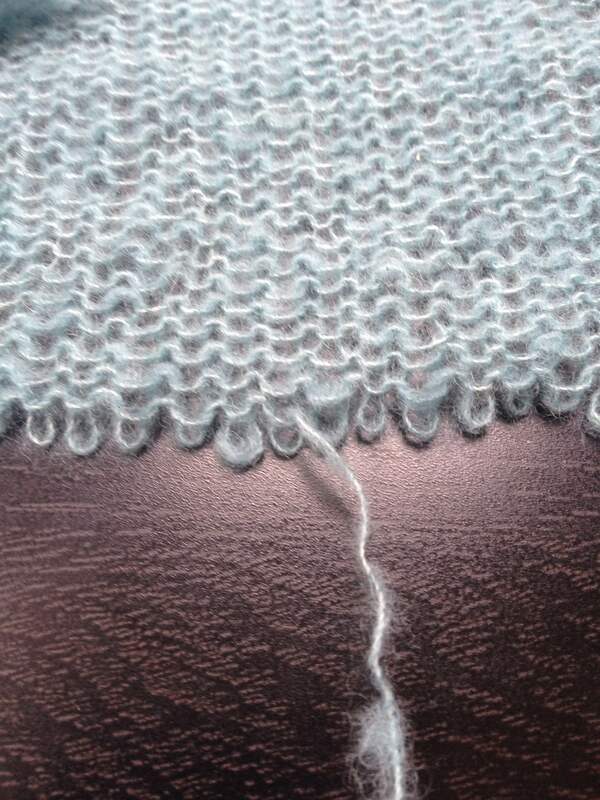 I think they look sloppy so it’s just knit a row, purl a row for the next 12″. 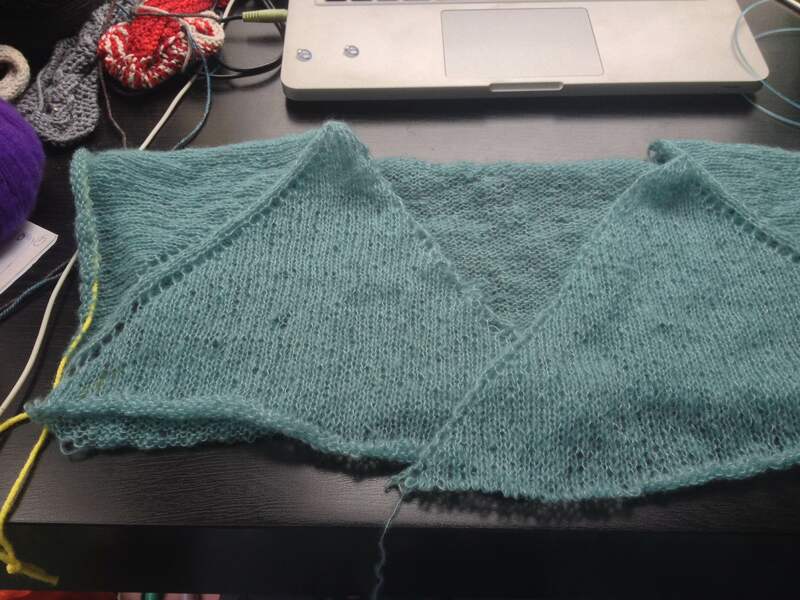 I’m hoping it’ll go quick…this project is so lightweight, the finished sweater will be only 75 g, it’s perfect for on-the-go knitting! Just keep knitting!